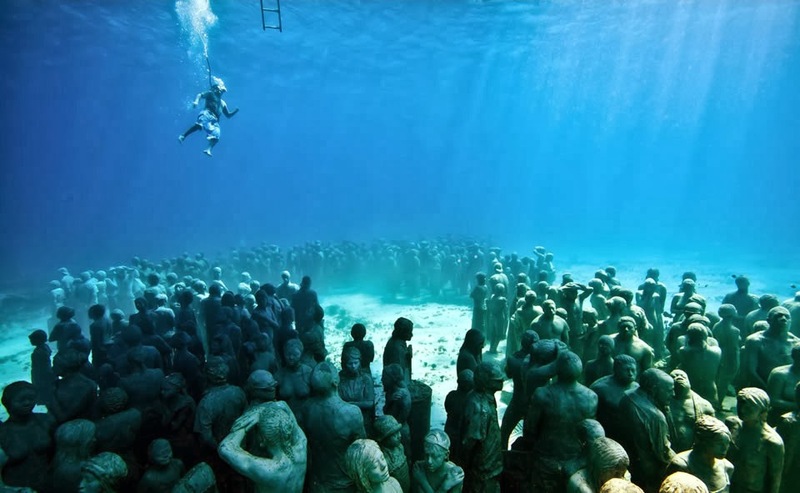 If you haven’t been to Cancun, Mexico in several years, there’s an amazing new attraction that you won’t want to miss—sculptures at the Cancun Underwater Museum. Snorkel or dive among more than 400 life-size figures surrounded by a variety of fish and marine life. 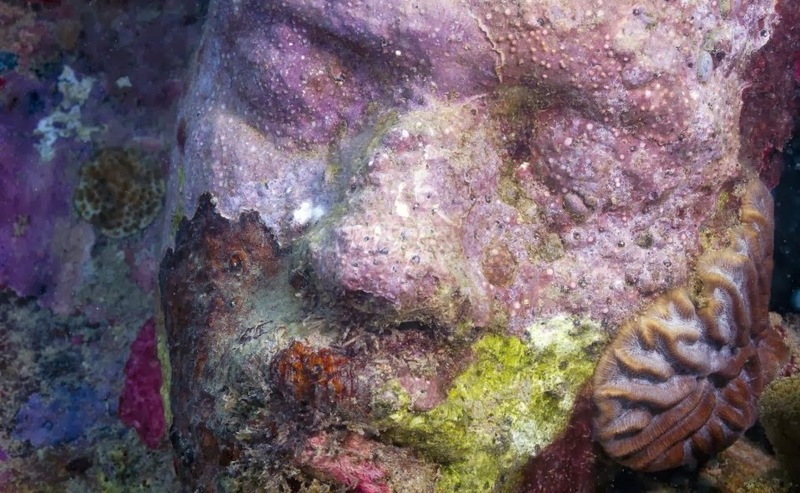 Coral has started attaching to the sculptures in the ocean. 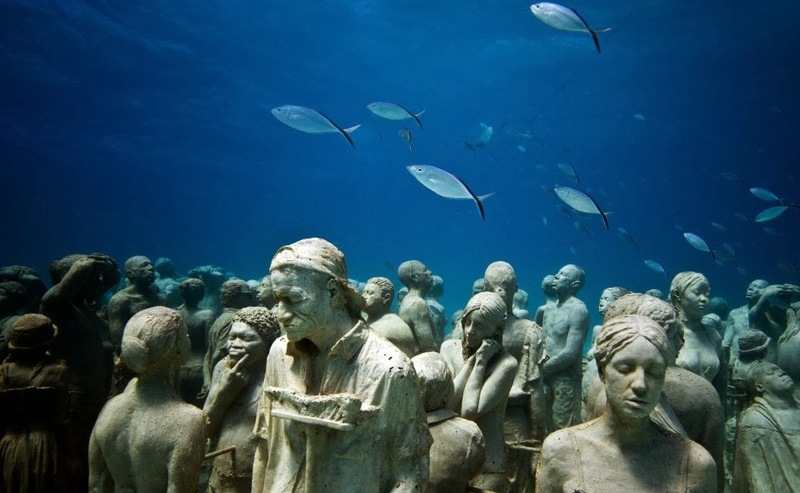 The monumental underwater sculptural museum was established in the waters around Cancun, Isla Mujeres and Punta Nizuc by British artist Jason DeCaires Taylor. It will be an ongoing project for years to come. 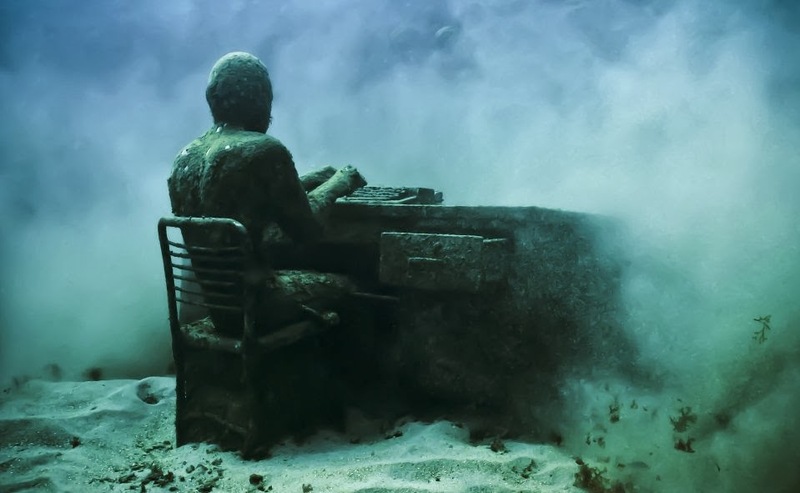 New since September, 2013, The Cancun Convention & Visitors Bureau has opened Cancun Underwater Museum Visitors Center, showcasing replicas of 26 of the Cancun Underwater Museum’s (MUSA) most popular underwater sculptures. Taylor added 11 new sculptures in September bringing the total of underwater art to 500. 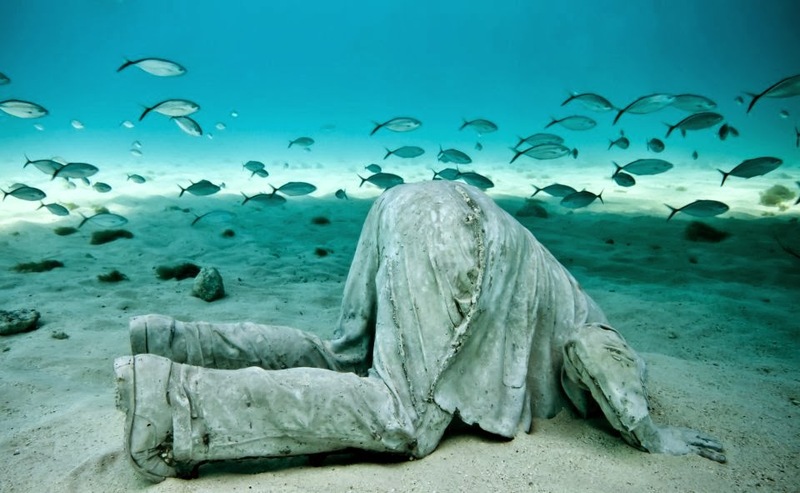 Incredible work by artist Jason DeCaires Taylor. 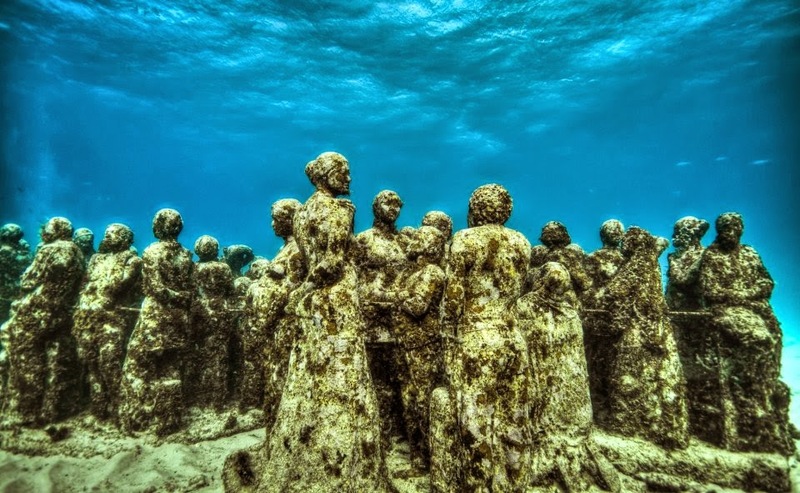 Since its beginning, the Cancun Underwater Museum was created to facilitate the preservation of natural coral reefs by doubling as a home for fish and other underwater organisms, drawing visitors away from Cancun’s delicate natural reefs. Pieces were first submerged in the main body of the museum, “The Silent Evolution” gallery, in 2010. According to Taylor, “the new pieces use a revolutionary form of stainless steel framework and will rely on live planted corals to form the narrative and structure of the works.” Two of the new sculptures include “The Glass Ceiling” and a new “Man on Fire” piece. Submerged sculptures are mostly molded in pH neutral clay; marine life has slowly moved into the museum area, bringing life to “The Silent Evolution.” With everything from life-size human sculptures, many of which were cast from Cancun locals, to a full VW Beetle that was especially designed for lobsters to make their home inside the vehicle, each statue is made with materials that are safe for marine life and encourage the formation of a coral reef, thus fulfilling the main preservation goal of the museum. Underwater figures will be covered in marine life. The Visitors Center features a step by step process of how and why eco-sculptor Taylor created his renowned art. Roberto Diaz Abraham, MUSA President, has high hopes for the center and believes it will be as popular as the museum itself, which welcomes over 87,000 tourists a year. Divers get a good look at the massive exhibition underwater. The Visitors Center is located at Kukulkan Plaza in Cancun’s famous hotel zone, making it easily accessible to visitors. 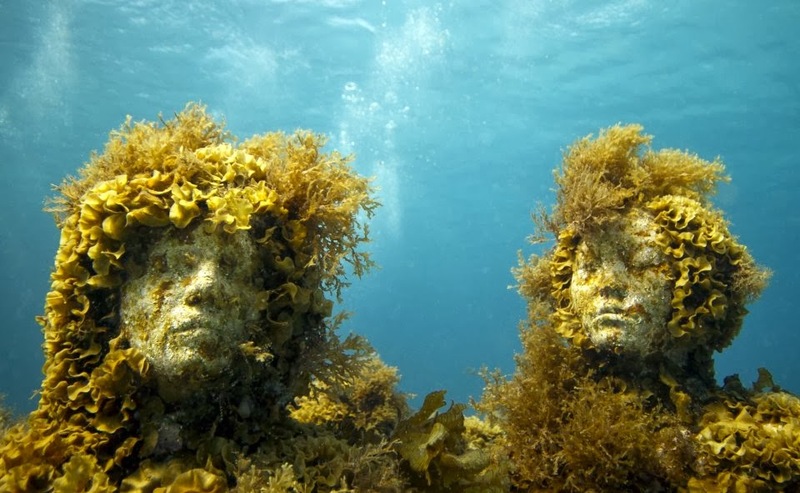 Guests who explore the underwater museum can enhance their experience by visiting the center, which can also be an alternative for sea-wary travelers to use should they wish to view Taylor’s art without having to set foot in the ocean. Plans include another visitors’ center in Isla Mujeres that will showcase original pieces by Taylor and will serve as a venue for visitors to appreciate the museum for not only its art, but its ecological and preservation efforts as well. Creations are becoming more bold and imaginative. Information contributed by Lourdes Perez.